OK, that’s nice to know… but what I can do there when it’s expanded? Text should say also something like “preview more themes” or similar. This is a UI issue for all users: I just clicked on “Customize”, I know I’m in a place where I can customize things. So what I understand is I can “Customize Site Title & Tagline”, “Customize Colors” etc. and for analogy with other titles the information I get here is that I can “Customize Theme: Twenty Fifteen”. Nothing about a “preview”. 2. Empty tab stop after “Add New” and before search. Empty tabs stops are confusing for users, they can’t figure out what’s in there. What happens after you open and then close the modal? fadeOut() sets display to none and ‘.theme-overlay’ is no more focusable: no more empty tab stop. Should be display: none also on first load, to avoid the empty tab stop. Focus + Enter on “Theme Details” doesn’t trigger the details modal. Everything must be operable with a keyboard. Elements need to be focusable to receive keyboard events. Why binding keydown event on ‘.theme-screenshot, .more-details, .theme-name’ when they’re not focusable. No focus, no keydown event. What about to bind keydown directly on ‘.theme’ which is already focusable? And then move ‘.theme-actions’ out of ‘.theme’ and position it absolutely? ARIA role and aria-label on the details modal, to give feedback a modal is currently open. Important: to be done together with point 2. For consistency with 5., change the close button text in ‘Close details dialog’. Current text ‘Close overlay’ doesn’t help me to understand what an “overlay” is, that’s developers language. 7. Contain keyboard navigation inside the modal. When a modal is open, keyboard navigation must be contained inside the modal. WordPress already does this for almost all of its modals. Every modal has its own way… we should standardize this sooner or later. We can provide a working code example, not a real patch, we’ve just patched the plugin locally. Code borrowed from media-views “wp.media.view.FocusManager”. It’s just an example, this feature can be implemented in many different ways, see for example other modals (wplink, etc.). Little concerned about jQuery UI :tabbable performance, maybe not an issue. The preview <iframe> should have a title attribute. Focus on Add New Theme box (the last one in the left sidebar). Recommended: make focus style same as hover. only “the WordPress team” is a link, when read out of context has no useful meaning. Would be nice to have some more text in the link (maybe using screen-reader-text) with the current theme name. Needs .org API change? Important: when the sidebar panels slide out and are out of view, they’re still focusable and “tabbable”. You can tab through them and also activate their controls, just focus one of them and press Enter. Recommended: when panels slide out and their animation ends, they should really be hidden with display: none to make their controls not focusable. Consider having some sort of mechanism to quickly jump from the sidebar pane to the preview pane and vice-versa. Say you’re a keyboard user, you choose a theme and you press Enter on the “Live Preview” button. Page is updated and focus is lost. To navigate with the keyboard to the preview pane, you have to tab through all the sidebar controls first. Same when you want to return to the sidebar pane after finally getting to the preview pane. Say you choose a theme and finally tab to the preview pane: there’s a chance you’re previewing a totally inaccessible theme. As a screen reader user you may be totally lost, as a keyboard users you could fall in some keyboard trap. Recommended: add a way to easily exit the preview pane and move focus back to the sidebar. Some browsers, especially when in combination with some screen readers, have issues giving focus to iframes. Missing first level heading. todo check header hierarchy. there’s a label that wraps 2 input fields, one gets revealed when picking a color. We understand this is how iris works, BTW screen readers won’t get the association between the label and a form element. The “background_image-button” button is the “Change Image” button. Result: click on what appears to be a title: “Background Image” and a modal opens. Several empty links (some of them maybe img without alt? some just empty). See several add widget toggles a.widget-action with no text or aria-label, just empty. They should have some text that makes sense also when read out of context. Buttons should be buttons (see primary button is an <a>). Color contrast: active/focus state, accordion toggle arrows, etc. Why .theme-overlay .theme-version has user-select: none; ? As a user, I want to be able to select that text. Attributes should be escaped? see e.g. All the <button> elements need type=”button”. Consider the use of event namespaces? Enhancement: maybe .theme-header should not be rebuilt on each prev/next ? With .theme-header being “fixed”, focus would not be lost on each prev/next action, this would save focus handling via JS. 27. Bug in Chrome when focusing the close button. Couldn’t reproduce using Firefox, looks like it happens just in Chrome. See attached screenshot: as soon as you tab on the “Close” button, the sidebar pane underlying the details modal slides out and the main accordions gets in. it inherits overflow: auto from theme.css so it can scroll horizontally. 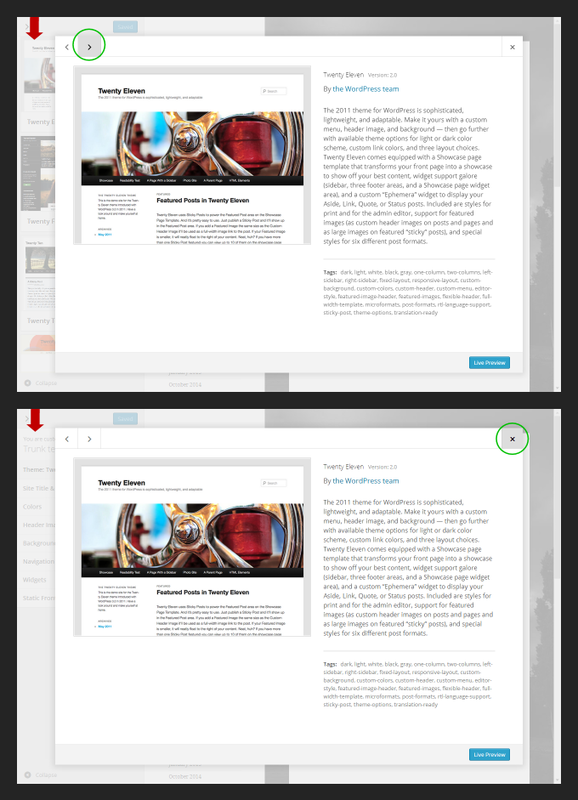 When focusing any focusable element on the right side of the details panel (close button or links in the content) it will scroll thus moving the sidebar on the left. Thank you @afercia, @trishacupra, and @rianrietveld. Very thorough! Amazingly thorough test. Excellent work. This is great data – thanks for doing this! Thanks for the detailed & thorough testing! I’ve popped into #accessibility on slack and will work through these issues today. Many of these issues require core patches; I’ll create tickets for those and patch them (although I may leave some as good-first-bugs); it would be great if a committer could follow up on those soon. Please let me know if any of these changesets look incorrect in any way. Working my way through the list from the top, will do a second pass to create the core tickets that I know the fix for. 10. This would be a core patch at least, and possibly an API change. Could you create a ticket for this issue on core trac targeted at the current admin themes page, which has the same issue, which would most likely also fix the plugin? 11. I think #29949 would probably fix this? 15. The proposal is to make that section go away in the merge patch, so should be a non-issue. 16. todo core ticket/patch #customize-info .accordion-section-title should probably have a h1 somewhere? 20. See #29158. Would love to get that resolved, it’s really bad right now. 24. Not sure that that’s needed since everything’s already scoped to the Customizer section/control, but I’m open to suggestions/patches. 26. Could get a bit messy since there’s no container element for to sibling elements to .theme-header, is there a specific benefit here other than saving some JS? I left some as good-first-bugs. I didn’t make tickets for ones where I’m not sure of exactly what’s needed. Nick thanks very much for your complete review and fixings. Seen many of them are already in v. 0.8. This is a superb report. I’m learning a lot just by reading it, because the report spells out “why” something is broken for the user, not just what is broken. I hope to see more reports like this. “Search installed themes” gets read out twice. Repeating the same text in the label and in the placeholder it’s not a so good practice. Placeholder should not be used as a label but as a “hint” about how/what to enter in the field. Edited: added 3rd new issue. “add-new-theme” DIV added as last items inside UL: invalid/non semantic code, also problematic for accessibility: how many themes in the list? Add new theme link is a control logically separated and should be outside of the list. “Search installed themes” gets read out twice, at least with NVDA. Repeating the same text in the label and in the placeholder it’s not a good practice. Placeholder should not be used as a visual label but as a “hint” about how/what to enter in the field. Old 1. The accordion title doesn’t convey enough information about the purpose of this section. > Our biggest remaining decision is whether to change the title of the “themes” section in the Customizer. Note: there’s ongoing discussion about the header area, involving possible UI changes. Old 10. Tabbing in the modal, there’s no easy way to find information about the theme! > This would be a core patch at least, and possibly an API change. Could you create a ticket for this issue on core trac targeted at the current admin themes page…? Thinking about this, not sure what we can do here about “authorAndUri” returned by wp.org API, there are also translation issues to take into consideration. OK, just mentioned here as a reminder. All the other issues already have a ticket or they’re not strictly related to the Customizer Theme Switcher, but to the Customizer itself, will open new tickets. 1. unfortunately we can’t change that. The way the Customizer works, all controls need to be children of the same container, in this case the ul. We could put the add-new div within an li, though, if that would be better. 2. So can we remove the screen-reader-text label then? We’d want that text in the placeholder only by default, but if we need to do anything additionally for accessibility let me know.